Mary J. Tosh is my third-great grandmother on my maternal side. She was born February 14, 1835 in Virginia to Thomas and Lucy (McClanahan) Tosh and was the first of eight children. Thomas Tosh was a wealthy land and slave owner in Roanoke County, Virginia. In 1860 his estate was valued at more than $500,000 in today's dollars. The Tosh family fortunes begin to change in the 1850s/1860s. First, Lucy Tosh died of a heart ailment, probably a heart attack in 1856. And then the Civil War came to Virginia. It's hard to imagine your home being a battlefield, yet the Tosh family was right in the middle. It appears that two of Mary's brothers fought in the war. James T. Tosh attended the Virginia Military Institute and served as adjutant general and aide-de-camp to Brig. Gen. Robert E. Colston, commander of the 16th Infantry Regiment. He would have been the General's right-hand man. William Tosh served in Salem's Flying Artillery with his brother-in-law and Mary's husband, Marcellus White. Mary had a lot of loved ones fighting which probably meant meaning stressful years. 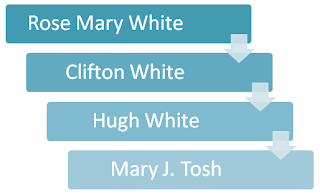 I have no record of Mary Tosh's marriage to Marcellus White, but I believe they were married in 1859 because their first child was born in July 1860. All records that I have found for their first child, Thomas White, indicate that he was born in Virginia. Yet there is not a record of his parents in Virginia during that time. 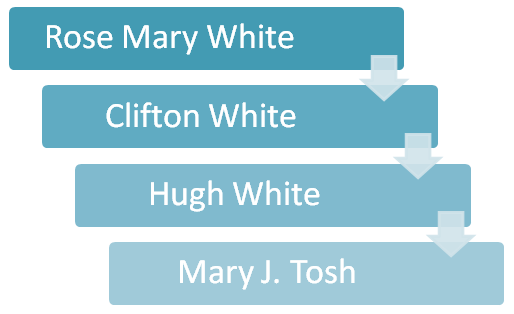 There is a "possible" 1860 census entry for the White family in Ray County, Missouri, which could include Mary. However, she is listed as living with her father in Virginia in 1860. You just can't be in two places at once, Mary. I believe that Marcellus and Mary knew that a war was imminent and decided to move their family further away from the center of the action, hence Missouri. Or, they could have been following Marcellus' sister and her husband, who had moved to Missouri in the 1850s. Sadly, Missouri was a very dangerous place during the war thanks to guerrilla warfare running rapid, so the young family was no safer there. Regardless, Mary spent the entire war raising her son on her own (with possible help from her in-laws). Marcellus fought for the South throughout the war, even spending a year as a prisoner of war. It must have been a very difficult time for Mary. Upon his return from the war, Marcellus and Mary settled in Ray County, Missouri and continued their family. Marcellus was a farmer and Mary a housewife. Little information is known about the couple. I have found no record of Marcellus owning land. Marcellus died in 1895. Mary lived on for another twenty years. 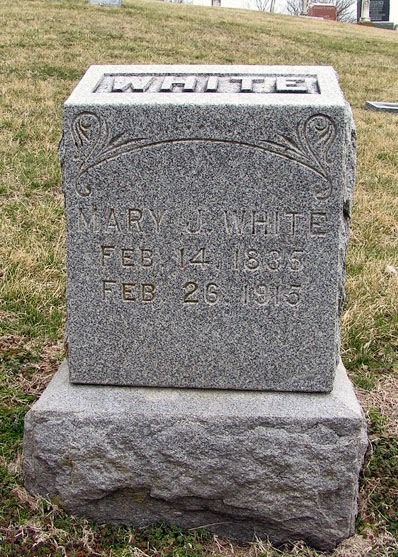 In her later years she lived with my second-great grandfather, Hugh C. White. She died February 26, 1915, just 12 days after her 80th birthday. 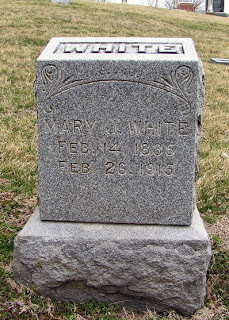 She is buried next to her husband in Lavelock Cemetery, Hardin, Missouri. No "due outs" on this family! Very interesting story with lots of facts. I have quite a few in my Virginia family that migrated to Missouri as well. Our lakehouse is located in Pittsylvania County, not far from Roanoke County. There's a Toshes Road -- I wonder if that's a corruption of "Tosh's" and that maybe the surrounding land had been owned by generations of the Tosh family. Good catch, Wendy. I do have "due-outs" I just forgot to add them! Hmm...I am intrigued by you Tosh road. I need to look in to the land that the Tosh family owned.